By all accounts, President Joko Widodo had a tough first year in office. The change he had promised during the 2014 presidential election seemed far from being realised as he found himself caught between his reform agenda and the oligarchy of Indonesian politics. His second year, which began exactly a year ago today, did not kick off too well either. South-east Asia's largest economy had narrowly missed its quarterly growth target of 5 per cent amid cutbacks in government spending, while its rupiah fell to record lows. Indonesia was also battling fires at home. The raging flames from land burning in Kalimantan and Sumatra led to a transboundary haze problem that was not only the worst on record, but had also pushed the country to the verge of a humanitarian crisis last year. These issues compounded the opposition's narrative then that Mr Joko, a political outsider with few ties to the Jakarta elite or military, was not the man to be President. However, the former businessman, elected in part by tapping the groundswell of discontent in a country long ruled by an elite class, seems to have turned the tide against his critics this year. An opinion poll by the Centre for Strategic and International Studies (CSIS) released last month showed that Mr Joko has maintained a high approval rating. Out of 1,000 citizens interviewed in August for the survey, 66.5 per cent said they were satisfied with his performance. CSIS researcher Arya Fernandes said this was a 10 percentage point bump from the President's first year in office. He attributed it to Mr Joko's focus on rolling out initiatives that made a difference to the man on the street, such as better access to healthcare and education. Political experts such as Associate Professor Bilveer Singh said Mr Joko's "people first" approach has helped him prove pundits, who doubted that he would survive politically, wrong. Indonesia's economy grew by 5.04 per cent in the first half of this year. This is higher than the 4.79 per cent growth recorded last year and far above the global average of 2.5 per cent growth. Land: Besides thousands of kilometres of roads and toll roads, including trans-island highways, being laid across the country, Indonesia is also expanding its rail network, such as the high-speed rail project between Jakarta and Bandung. Sea: It is also building or upgrading 150 ports as well as three maritime toll routes. Air: There are 17 new airports being built and 32 terminals being upgraded. Terminal 3 at Soekarno-Hatta International Airport in the capital Jakarta will go fully operational next year. Unemployment was 5.5 per cent or about 7 million people this year, down from 5.81 per cent, or 7.45 million last year. The number of citizens classified by the government as "poor" fell from 28.5 million, or 11.2 per cent of Indonesia's population, in March last year, to 28 million (10.9 per cent) in March this year. Indonesia's Gini coefficient, a measure of income inequality, has fallen from 0.408 in March last year, to 0.397 in March this year. The index ranges from zero to one, with higher values indicating greater inequality. 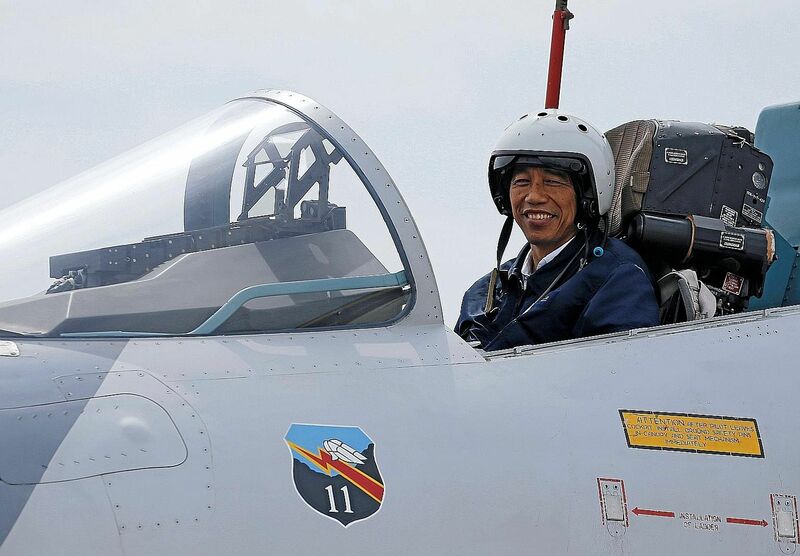 "This has to do with Jokowi's personality. He is corrupt-free, stubborn in his commitment to key policies, concerned with details and decisive," said Prof Singh, referring to Mr Joko's popular moniker. Indeed, the President has in the last one year consolidated his position politically by gaining control of Parliament. He had also succeeded - through a second Cabinet reshuffle in as many years - in putting together a team that he can count on, unlike his first Cabinet which was built in part to repay political favours. Dr Cecep Effendi, a political analyst from the Muhammadiyah University in Jakarta, said this has created political stability in Indonesia, which in itself was an achievement. "In the past two years, there has barely been any brouhaha in Parliament and this will be a plus point for Jokowi in the eyes of foreign investors," said Dr Cecep. Prof Singh, who is from the National University of Singapore, agreed. "All key political parties are part of Jokowi's coalition, allowing the President to push through policies in Parliament with little resistance," he added. Mr Joko has also surprised many by his repeated show of Indonesia's military might, particularly in the Natunas, an Indonesian territory that lies on the edge of contested waters, and recently the target of Beijing's disputed territorial claims in the South China Sea. But it is his commitment to infrastructure development which will be a game changer that will ultimately earn him a place in Indonesia's history, said Prof Singh. And unlike other Indonesian presidents, Mr Joko also appears to be willing to play a long game, as seen in his push for policies and projects that may well come to fruition only after he leaves office. That, however, is not to say that he has not made progress in any of the national development plans outlined in his Nawa Cita priority programmes. These include the building of more toll roads, airports and sea ports to improve connectivity and enhance competitiveness. These projects were funded in part by savings from a fuel subsidy cut implemented by Mr Joko early in his presidency. He has also raised the infrastructure budget from 290.3 trillion rupiah (S$31 billion) last year to 317.1 trillion rupiah this year, and has plans to beef it up to 346.6 trillion rupiah next year. Indonesia, however, will not escape the global downturn, which has already led to a cut in its state Budget in recent months. This is why Mr Joko has placed a strong emphasis on the success of a tax amnesty, which was introduced recently to plug Indonesia's budget deficit, as well as to reform its tax regime in order to raise revenue in the long term. His achievements thus far aside, the President will no doubt approach his third year in office with an eye on re-election in 2019. But besides dealing with a slowing global economy, he will also expect to continue to confront challenges at home, including the growing threat of extremism, endemic corruption and the tedious process of cutting red tape, among other bureaucratic and political reforms. Rising tensions between the United States and China, and the latter's claims in the South China Sea, may also prove to be a foreign policy challenge for Mr Joko if Indonesia is forced to choose sides. "But what is certain is that Jokowi has proven in the last two years to be an Indonesian leader who can rise to the occasion when the situation is very bad," said Dr Cecep.